Its been a week since I’ve got my ride and life is good. I’m slowly getting used to the roads and slowly getting a little more confident in parking at public places. First few days wasnt like that though. I kept turning to the wrong junction and then rode round and around the area wondering where the heck I was. Actually I still get lost till now, but the good thing about Singaporean roads is that there are prominent signs everywhere around the major roads that you will eventually get your bearings again. When I arrived at my workplace with my scooter, the look of the guard, Mr Singh, was priceless! His mouth was literally agape. Mr Singh : Marina! You’re riding?!?! Mr Singh : When you were telling me that you were getting a bike, I thought you were joking! There were many people who were surprised that I could ride – Teachers and students alike. Even my classmates at night class were in disbelief. Classmate : Huh? Where are you going? Arent you going to take the bus? Classmate : You’re joking right! Me : No lah. I really am taking the scooter. Classmate : But .. But … You’re wearing a skirt! I think there’s nothing wrong with wearing a skirt while riding. The scooter is designed in a way that there is a free area to rest your legs in front, unlike regular bikes that require you to sit with legs apart. Thats what makes a Vespa popular choice with women. At the same time, being females on bikes, bring along unwanted attention. I was riding along night class and there were a two men on a bike teasing about the way I ride, “Way go go sis! Go on behind the car!”, they shouted while they continued to snake along in the traffic. Yesterday, while I was on my way home from the highway and stopping at the red light, I saw a man in a lorry, first looking in surprise and then he waved and smiled at me! Even after parking my scooter at the commercial center, IMM, I heard cheering and whistling from the construction workers. And I looked around to see what they were cheering at. I finally found out that they were cheering for me. The only negative thing about it for the moment is that I think that the fumes from the exhaust pipes are bringing my immune level down. I’ve started to sniffle, have sore throat and random migranes. Maybe its the flu season upon us again. Way to go, sistah! Ride it ooooooooooooooooooooooooon! Btw, why are females ‘weird’ on scooters? Are we not meant to ride on scooters or wad? Say when you are riding and not sure where you are, do slow down and park on the side to check for any landmarks. Doee doee : Its perceived that biking is for the manly 0.o So when girls in skirts gets a two wheelers, alot of people in general are surprised. 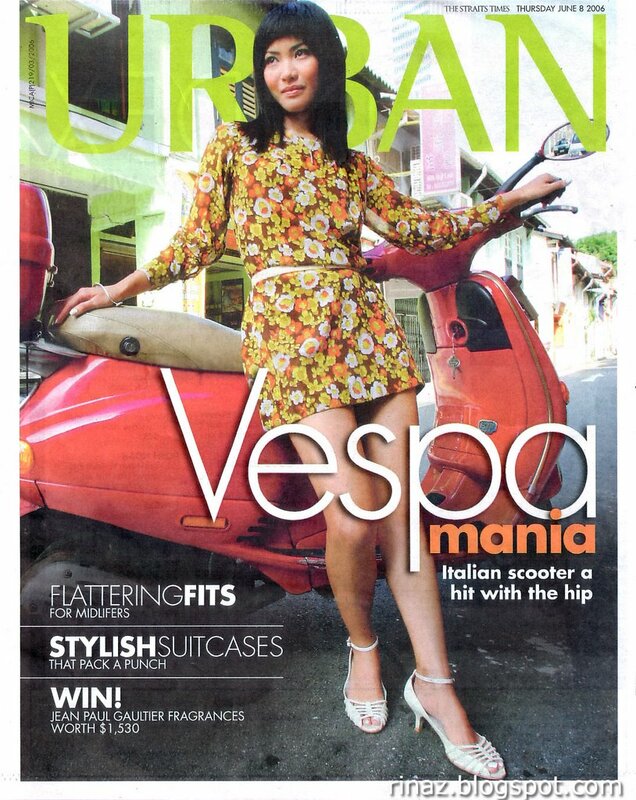 oh gosh oh gosh, I so want to get a refurbished lime green vespa when I’m older! Cheah : Yeah! Green is such a sweet colour isnt it! 😀 Have you gotten your 2B license yet? no man, mom won’t let me. I got class 3C though, once a while I get to drive the family’s manual car. Manual cars rock!